-Model has heavy miterfold black vinyl legs with chrome plated leg levellers for easy and accurate levelling. -Heavy 2” triple chrome plated leg supports. -New raised dome easily removed with no attachments. Dome is made from thick shatter resistant PETG. -Proudly "Made In U.S.A." sports theme features realistic red, white and blue hand painted numbered players. 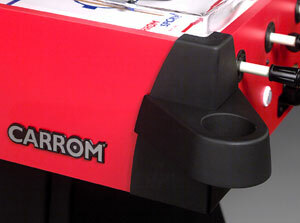 -Sliding gear mechanism feature moving clutches to prevent binding. Self-lubricating plastic gears provide extended life and durability. -Solid fiberglass rods with cushioned grips factory assembled to the gear mechanism. -Game includes two pucks and two sets of players, one paintable and one hand painted. 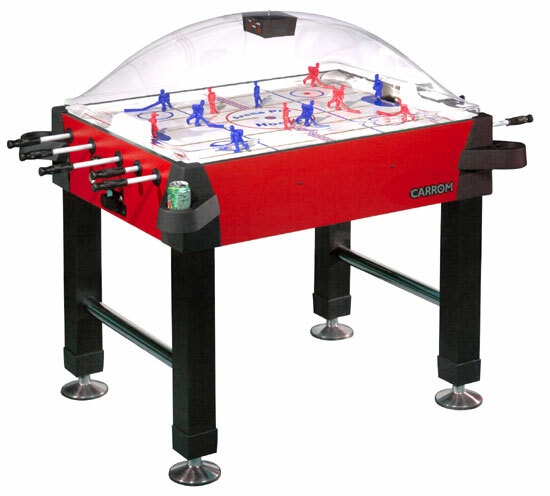 -Game is fully assembled except for electronic scoring unit, cup holders and legs.. Cabinet ....................... 59 1/2" x 37 1/4" x 25 1/2"